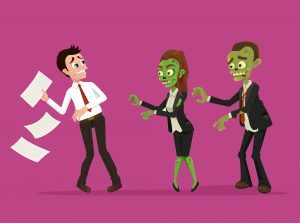 In honour of Halloween, we have compiled some truly terrifying things that can happen to the best of us when getting a job. Not for the faint hearted. You really do have a good eye for detail but how can you claim that when you have just proved otherwise with typos or other mistakes in your application. You picture them reading the error and cackling as they cast your application aside. Why oh why did I not check it one last time? Even if you have prepared the answer, a question can catch you off guard and suddenly your brain empties and you are having flashbacks to the classroom when you were blanking in front of everyone and the other kids were laughing at you. Your reptilian brain is activated and you freeze like a frightened deer or a rabbit in the headlights. You don’t answer for about 5 seconds in the hope wisdom comes in that time. Then when it doesn’t, you politely ask to move on and end up remembering half way through the next question asked. Noooooooo! Especially in a popular field, competition can be severe and extremely daunting. How can you prove yourself and succeed when so many good people can beat you to it? Again, your imagination kicks into overdrive and you might have to do a song and dance to differentiate yourself!